The rules for soft skinned transports allow germans with the "Recon" special rule to be mounted on motorcycles (rather than trucks). 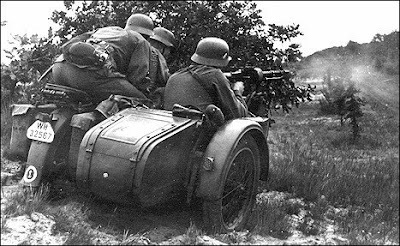 I have considered the following: A german platoon wants to take an extra squad as under strength and recon (6 persons) amounting to two motorcycles with sidecars. What I would like to do is pay 1 CE for the motorcycles (rather than roll against strategy rating) - and then get a mounted LMG on one bike and a pintle mount for the squads LMG on the other. This is basically the same as taking a Sd.Kfz 250/1 which are already covered by the rules for Panzergrenadiers. It would make the recon squad much more mobile at the cost of protection. It seems like a fair tradeoff to me, but I'd like to hear other opinions. Best thing to do is give it a go and let us know how you get on. Michael did you ever try that idea with the motorcycles as it would also work very well for the recon squad 1940. With that option you actually get 7 figures which would amount to 2 m/c combinations and a single NCO rider. Not yet, as I turned my attention to an american platoon. Hopefully time and money will allow for German MCs at some point. With the Black Tree Design January blowout (half price on WW2) this project has finally gotten back on track. I now have 2 german motorcycles awaiting assembly and paint, so I will give them a try as soon as they are done.